If you're suffering from a bit of FIFA envy, as you wait for the latest version of the world's most popular football game to reach Android, you'll be glad to know that Gameloft has finally released Real Football 2013 (or 'Real Soccer 2013' in the U.S.), and it's available for free from the Play Store. Last season's version of the game amassed over 5 million downloads, so Gameloft will be hoping that their latest title performs just as well. 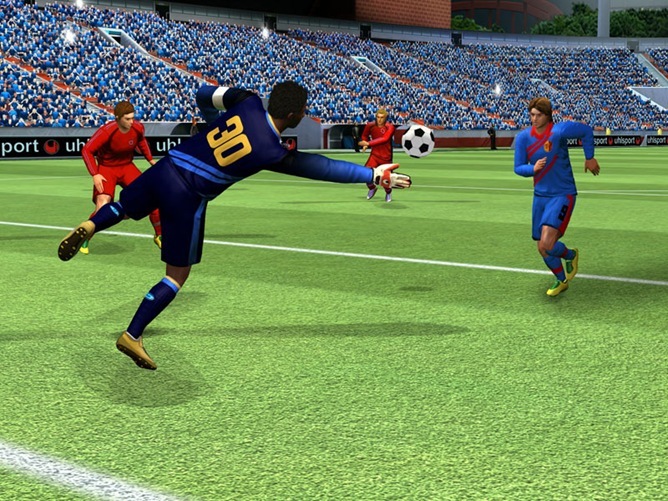 Like Real Football 2012, the new version contains a number of in-app purchases that can be made to help you progress, so if you spend a lot of time playing the game, you'll probably rack up quite a large bill in the process. Thankfully, Gameloft has also retained a FIFPro license, so you won't have to put up with ridiculous team names such as Middlebrook and Merseyside Red as you play against other Premier League sides. You will also be able to view full profiles of over 3000 players from the top leagues across Europe as you play the game. If you want to check out Real Football 2013, it's available from the Play Store on both sides of the Atlantic.